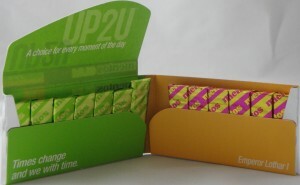 This is the 2nd gum flavor pack from UP2U I am reviewing. 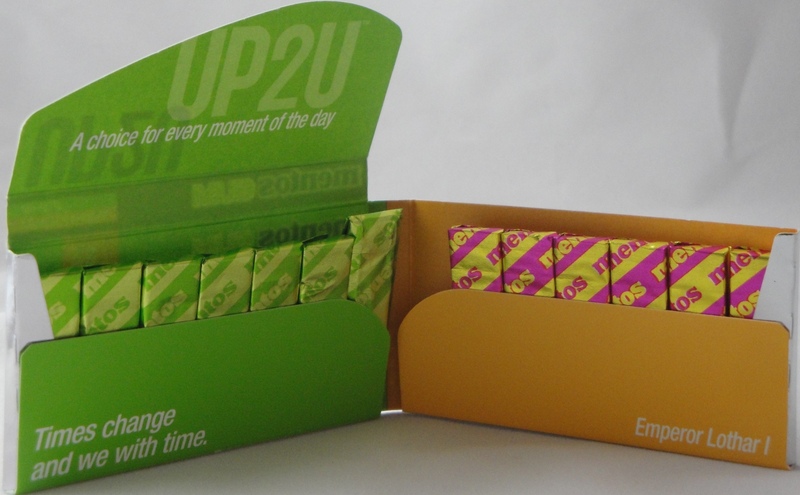 As previously stated, I love the marketing of this new Mentos gum and find it new, fun & exciting. I wish I could say the same about mandarin strawberry flavor. 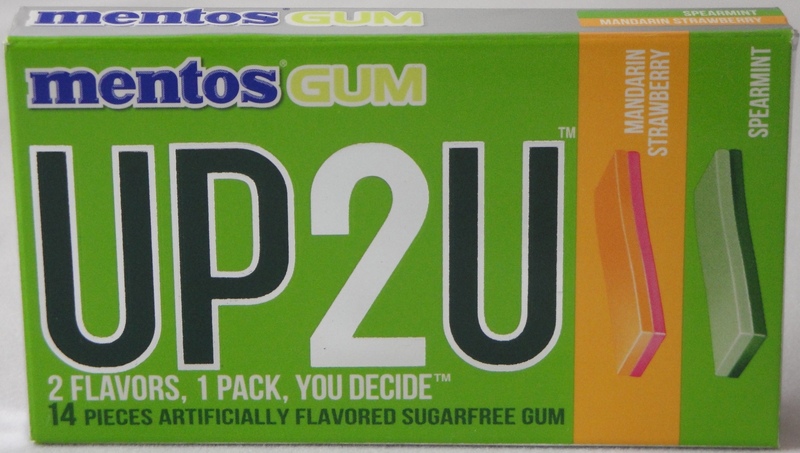 It’s an interesting concept for a gum flavor and seems better suited for an adult beverage. Strawberry lemonade is more mainstream and would most likely taste better. My biggest complaint about the strawberry mandarin flavor is the floral flavor, it made the gum perfumey. There were some green strawberry notes, woody mandarin character and orange follow through, but in general the floral note made it unappealing. The coolness level and lingering sensation was perfect. At 5-6 minutes into the chew my mouth was extremely cool: front of mouth, lips and throat. This sensation lingered for over 15 minutes. It was very refreshing. Oddly enough, the red flavor crystals in the yellow half of the gum were unpleasant. I found them gritty and they kept getting stuck in my teeth. The spearmint gum smelled ok, like a light green tea with creamy melon and cool menthol, however the taste was unbalanced and thin. At 45 seconds into the chew, all I could think was fuel. There was a bad off note, which I would describe as plastic magic bubble from my youth. Those younger than 40 might not have that memory. I would guess the spearmint oil used to flavor the gum was from India and not the full sweet American spearmint oil that I prefer. Again, I like the coolness of this gum and find it very refreshing. As our world becomes more global, we source more and more materials from India and other emerging nations. It’s difficult to find reliable data, but I have heard that 80% of the world’s requirements of oleoresins (spice extracts), herbs and spices come from India. Because of the change of growing place and agricultural practices, there exist subtle flavor differences that might be noticed in flavored products.